Walmart offers the Mohawk Home Memory Foam Bath Rug for $4.5. Features: Mohawk Home Velveteen Memory Foam Bath Mat. 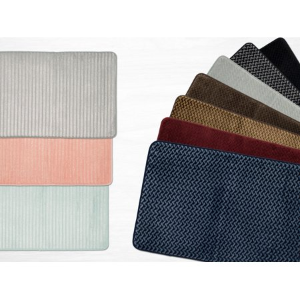 Turn your bathroom into a spa and pamper yourself with the plush pillow of softness that is the Mohawk Home Velveteen Memory Foam Bath Mat. Sink your feet into the indulgent comfort of our luxurious memory foam cushioned core. This bath rug is machine washable for easy care and backed with the security of a slip resistant nonskid backing designed to help keep you safe and the rug perfectly in place.